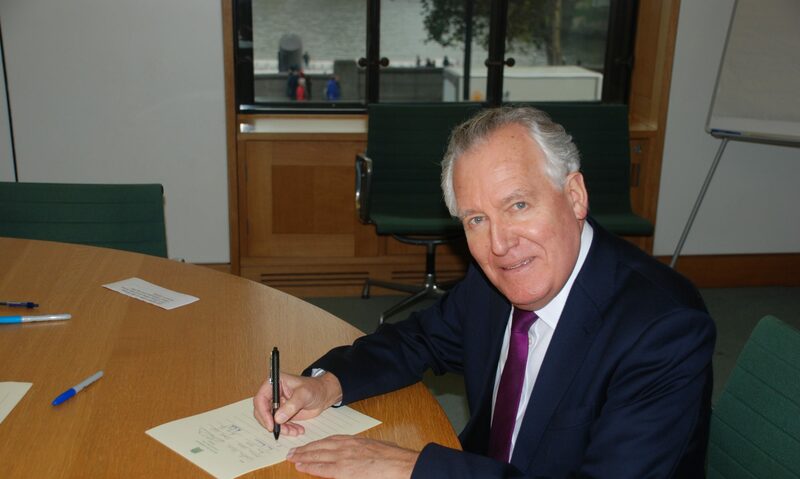 Mr. Peter Hain (Neath) (Lab): I always follow, with great respect, the contributions made by the hon. Member for South Staffordshire (Sir Patrick Cormack), because he is dedicated to making sure that this House’s proprieties and traditions are upheld, especially in its scrutiny of the Executive, and I salute him for that. However, I think it is important that this programme motion goes through—ideally, as the shadow Northern Ireland Secretary mentioned, there will not be a vote. I say that because, notwithstanding the understandable concern that there should be proper scrutiny—my hon. Friend the Member for Thurrock (Andrew Mackinlay) always makes that point with great persuasiveness—we must look at the big picture. I think it is important that Parliament passes this motion and clears this Bill today. This whole story goes back to what happened at St. Andrews in October 2006, when I was Secretary of State for Northern Ireland. The commitment from the Government to try to achieve the devolution of policing and justice by May last year was in that agreement. I concede absolutely the fact that my friends in the Democratic Unionist party did not sign up to that. The St. Andrews agreement was, as it were, the Government’s best call of where the consensus lay. Subsequently, we got the historic breakthrough when, early in 2007, Sinn Fein signed up to supporting fully the rule of law, and policing and justice in Northern Ireland—it had never done that before. Part of that agreement, which is crucial to the peace process and was crucial to the eventual settlement that we achieved, was on the understanding that policing and justice would be fully devolved to Northern Ireland. It is very important that Parliament upholds the spirit of the St. Andrews agreement; after all, the St. Andrews legislation, which was introduced shortly afterwards, was passed by Parliament and the objective then was set for May 2008—that date has passed, but it is essential that the momentum is kept in this process. I say to the House that having been right in the thick of the negotiations with Sinn Fein and the then leader of the DUP, the right hon. Member for North Antrim (Rev. Ian Paisley), to try to get the agreement that produced the settlement and, ultimately, the devolution in May 2007, I know that the policing and justice issue was crucial, and the DUP was rightly insisting that Sinn Fein sign up to it. Sir Patrick Cormack: The right hon. Gentleman knows full well that I admire the part that he played in achieving what was achieved in Northern Ireland—he played a very significant role—but he must appreciate that this is not a question of whether we have devolution. That is not at issue today, and there is broad agreement among the parties in Northern Ireland that they wish to move towards that. The Bill is not going to hold that process up or advance it; it is merely a necessary step. All that those of us who are arguing against the programme motion are saying is that the reputation that he and his successor have should not be spoiled by this indecent haste and undue pressure—there is no need for it. Mr. Hain: I just want to make these points and then I shall give way, because I do not wish to speak for too long. Everybody agrees on the principles. This Bill opens the way to that devolution, and that is why it is important to get it through in a timely fashion, today. Mr. Shepherd: The right hon. Gentleman mentioned that he has taken emergency Bills on Northern Ireland through the House. Is he suggesting that this is an emergency Bill? Mr. Hain: I am not taking this Bill through, and I was talking about what I had had to do—I had had to test the patience of the House. Obviously, all of us like plenty —[Interruption.] This is not an emergency Bill in the same sense, but it is a Bill that is vital to keep momentum in the process. I wonder why there is opposition to this programme motion; if everybody agrees on the principle, as everybody tells me that they do, if everybody says that they want to see this devolution happen, as everybody says that they do, and if everybody wants to make sure that the dissidents in the republican movement do not gain any extra purchase and the mainstream republican movement, led by Sinn Fein, is able to keep on the path to the devolution of policing and justice, why would people stand in the way of this Bill going through the House today? Dr. William McCrea (South Antrim) (DUP): How can the right hon. Gentleman justify one day of debate in this House and two days of debate in another House? Surely this is the proper place where the elected representatives of Northern Ireland, who are voted in by the people of Northern Ireland, scrutinise legislation. Mr. Hain: The House will have plenty of time to scrutinise this legislation —[Interruption.] This is a largely technical Bill. It comes from a process in which the First Minister and Deputy First Minister agreed in November last year on a way forward. The Assembly and Executive Review Committee reported in January on its conclusions, and this Bill largely implements what the Assembly wants. It is for the Assembly to decide when it delivers on the principle, so I cannot see why there is any reason to oppose a Bill that everybody says they support and that reflects the Assembly’s wishes. This Parliament, in this House today, is merely giving effect to the Assembly’s wishes. Mark Durkan (Foyle) (SDLP): One of the reasons we need more time to consider this Bill is that Members such as my right hon. Friend clearly do not understand some of the details of it. It is not good enough to say that it is merely technical, because it provides for the collapse and dissolution of a Department in a few years’ time, so it needs to be properly considered. He referred to legislation that he had pushed through this House. Does he recall the Justice and Security (Northern Ireland) Act 2007, which was rushed through in exactly this way? He promised us that it would be the last measure like this and that it would be the last model for the devolution of justice and policing, and he dismissed those of us who contradicted him by saying otherwise—we have been proved correct today. Mr. Hain: I do not agree with my hon. Friend on this matter. I am not going to repeat the points that I made, but I remind the House that it is for the Assembly to decide exactly the format of the new justice Department. We are facilitating a process, and unless we keep momentum in it, it could fall over. The need to keep momentum has been the lesson over the years in Northern Ireland. We were able to get momentum in the critical period in 2006 to 2007, which has brought us up to the point where the last bit of devolution now needs to be accomplished. Mr. Jeffrey M. Donaldson (Lagan Valley) (DUP): Will the right hon. Gentleman give way? Mr. Hain: I have to give way to a fellow Chelsea supporter. Mr. Donaldson: I am curious to understand what the right hon. Gentleman means by the process falling over. Is he aware of some threat that a particular party will pull the plug on the process if we do not get this through quickly? Is he seriously suggesting that if we take an extra few days to scrutinise the Bill properly, the process will fall over? Mr. Hain: No, I did not say that. Fellow Chelsea supporters should be more charitable to each other on these occasions. [Hon. Members: “They need to be.”] I know that the First Minister is also a fellow Chelsea supporter, so I know that he will support me on this occasion. I understand the need for parliamentary scrutiny, which was well expressed by the hon. Member for South Staffordshire and, I am sure, will also be well expressed by my hon. Friend the Member for Thurrock, but I urge the House not to divide on this motion.